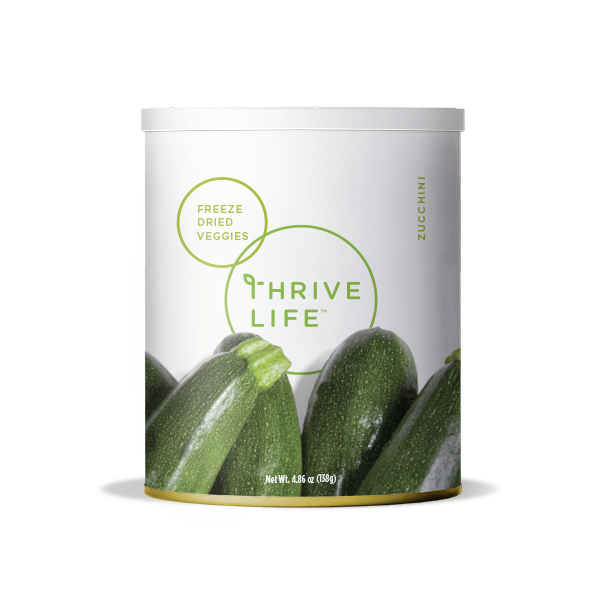 THRIVE Zucchini is a summer squash that you crave all year long. And thanks to the THRIVE freeze drying process, you can now have it in any season. Simply open a can and toss THRIVE Zucchini into a fresh garden salad or warm, winter soup. No matter how you eat it, you will benefit from the vitamins found in each bite. Add 1/3 cup of water to 1 cup Zucchini; let sit covered for 3-5 minutes or until tender. Add these bite-sized chunks to pasta primavera and mixed veggie sides, or puree them into powder for easy zucchini bread.